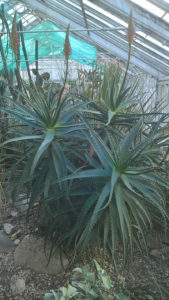 A statuesque, branched succulent, growing to 3 metres in height and width. It has stunning orange-red, torch-like flowers which are pollinated by nectar drinking sunbirds in the wild. The evergreen, succulent leaves are toothed and contains a bitter juice to stop predators from eating it. The word Aloe is from the Greek alsos and Hebrew word allal meaning bitter and refers to this bitter juice. The specific epithet; arborescens means tree-like. It is easily propagated by stem cuttings in a sandy or gritty compost during the spring or summer. It is better to let the cutting callous over where it is cut before inserting into the compost. This prevents the sap from dripping out and the cutting from rotting in its own moisture. Only water the cutting if it is shrivelled or when there are roots growing out the drainage holes.